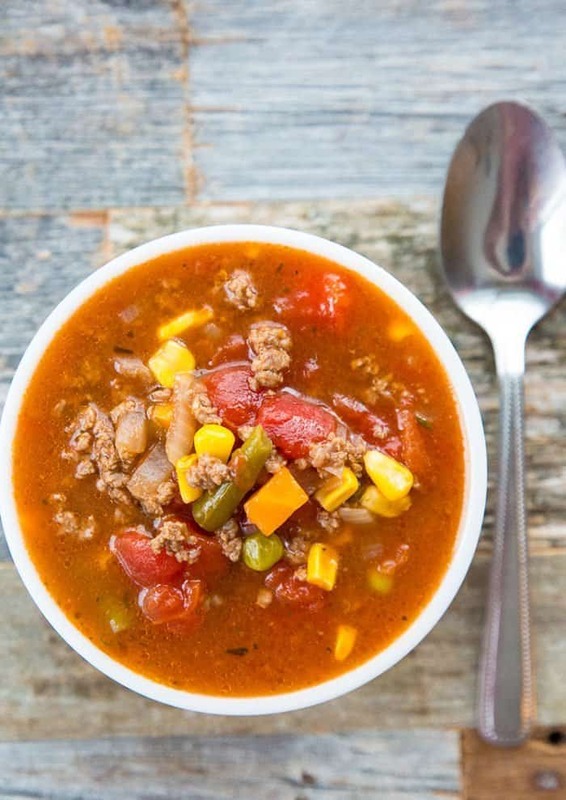 This simple, classic hamburger soup recipe is a Canadian staple. I’m pretty sure that it was first published in a Best of Bridge book, those classic cookbooks that our moms swore by when we were growing up. I’m not going to get into an argument over whether it’s Canadian or American recipe in actual origin ( because really, you can’t track recipes that are this old) but I CAN guarantee that this recipe was made mainstream and popular by those ladies that wrote the Best of Bridge books. 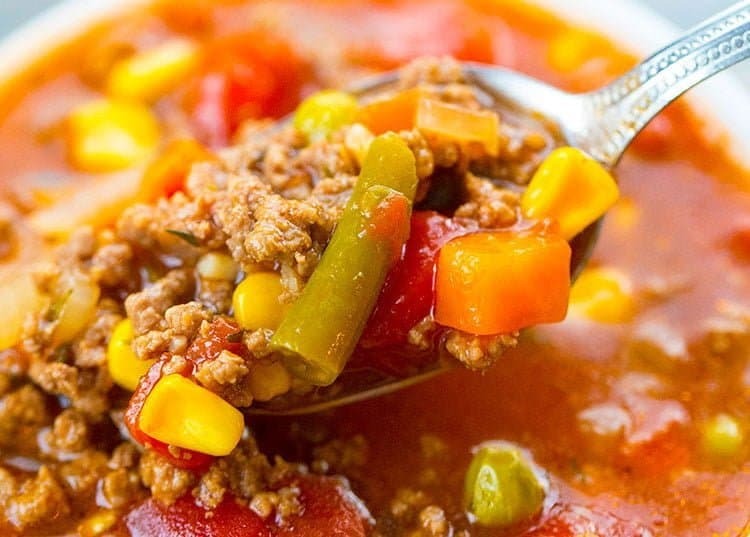 Everyone loves a good hamburger soup. You can make a million variations on it, from adding potatoes to adding barley, but I like it in it’s purest form: ground beef and frozen vegetable mix. It’s fast, easy and you take one look at it and you are transported back to your childhood at your Mom or Grandma’s table. 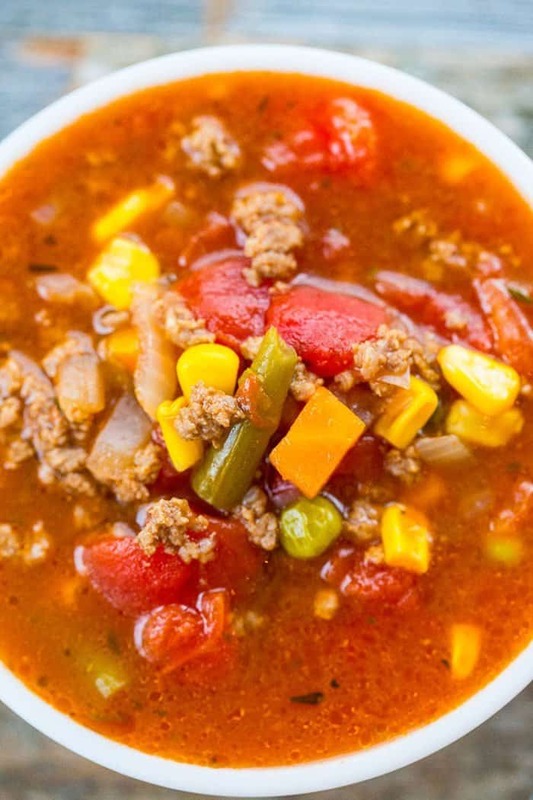 Grandma always used the frozen veggie mix.I honestly can’t imagine using any other type of vegetables in this hamburger soup but you could definitely tweak this recipe to your own liking. I am also sure that the original recipe most definitely used a can of tomato soup so for posterity’s sake, I used one as well. Sometimes it’s not just about changing recipes and getting rid of the canned soups, sometimes my friends it’s simply about recreating the EXACT same dishes we ate as kids, canned soups and all. And that’s ok. Sometimes I want the EXACT TASTE from when I was a kid. Use Campbell’s tomato soup for the best, most classic taste. That’s what Grandma used to use and it’s ok to use canned soup once in a while, you guys. Sometimes you just need that taste. Use those frozen vegetables to make your prep time shorter. You can use fresh vegetables as well, no doubt about it, but make sure that you dice them smaller. If you can find alphabet pasta, then it would be soooooo good in this soup! Want to try some other canned soup recipes? Maybe it’s Shipwreck Casserole where you totally have to use canned soup. Or how about my Buttery Mushroom Rice? I’m sorry but nothing tastes as good a can of mushroom soup in that recipe! Ever. So I have left this hamburger soup recipe as is, as it was and as it tasted oh-so many years ago. You can feel free to substitute in tomatoes for the soup, but the taste will be different. I’ll be making this again soon, since Edmonton seems to be stuck in a deep freeze! Brr! The only good thing about the cold weather is SOUP! Pin this recipe to your Soups & Stews Board! 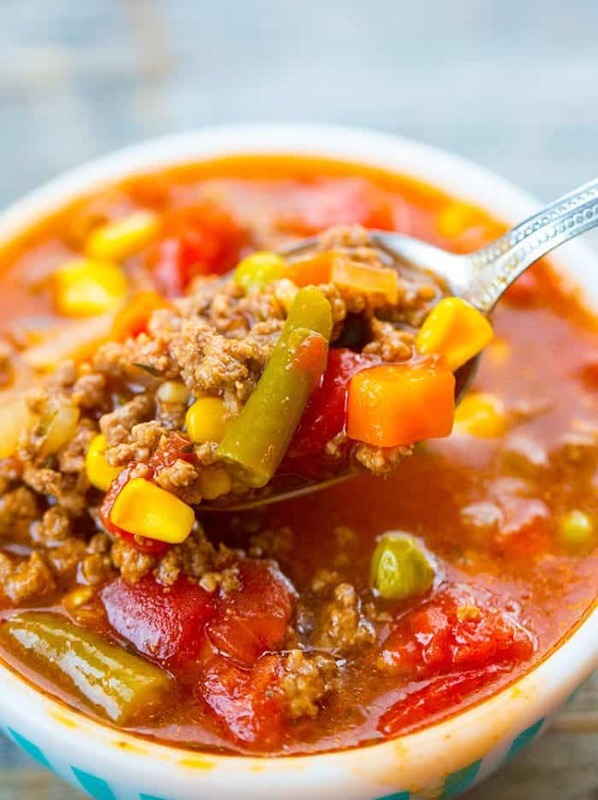 This easy to make and classic hamburger soup has been a dinnertime staple for decades now! white sugar if you find your tomatoes are too acidic, the sugar will cut it. Remove the bay leaves. Ladle into bowls and serve! Fry the ground beef and onions together in the metal cooking pot in your Instant Pot using the "sautee" function on your Instant Pot until the ground beef is cooked and the onions are translucent. Add in the garlic and fry until brown. Drain the fat. To cook immediately, press the soup button, seal the Instant Pot, close the vent and cook for 30 minutes. Let it naturally release - you can manually release but for safety's sake I don't recommend it. To slow cook all day, use the slow cook function and cook on low for 8-10 hours. Fry the ground beef and onions together in a large stockpot until the ground beef is cooked and the onions are translucent. Add in the garlic and fry until brown. Drain the fat. Simmer on medium heat for 60 minutes.